The podcasts and weblog of a 40 year old bloke from Birmingham, England. It's finally, finally here.... no, really, I promise! Podcast 196. phew... here's the MP3 link you can donload right here. I think it is high time I dusted off the blog and podcasting equipment and got my backside into gear with another podcast! I have the music to hand - I just need a bit of time. Podcastpaul - podcast no 195 is here - Download the MP3 at this link Sorry it's taken so long. Great to be back on the mic again - as per normal the usual banter and indie tunes. Music from Matthew Ebel, Echoes De Luxe and Omar Alexander / Soulare. Does anyone have an iPhone4 ? Can they review it? Is it any good? Tell me about your favourite iPhone Apps! all music courtesy of musicalley.com from Mevio. podcast194 - here at last! Download the podcast from here directly. podcast 194 in mp3 format. My apologies for keeping you all waiting so long! Lots of chat and music - all bundled up in a small mp3 package. I'm sorry, who said Welsh Translation was easy then? This is a wonderful song, but I couldn't understand a lot of the lyrics. Now,thanks to my mate; Adam, I can.... bless him. Fairytale of New York....with lyrics, courtesy of Mr Adam Burgoyne. 'Lucy goes to Iceland' deserves to go viral - the fact it was filmed in the Iceland about a mile and a half up the road is purely co-incidental. Yesterday was not much cause for a celebration, but nevertheless it was my birthday. I remember a time when I would count the months, weeks, days and eventually hours to midnight when it seemed perfectly legitimate to tear open the wrapping from my birthday presents. The night before my birthday, Harry stayed awake until I had returned from visiting my mum and dad. He was anxious to give me my birthday present, and even though it was just after 10 PM and not the legally correct time of midnight I was happy to open his present he had perched on the end of the bed for me. I am now the proud owner of a grey trilby-like hat. Sue was equally eager to me to tear open the large box that had arrived a little while earlier and no doubt had been expertly hidden away somewhere. I am now the proud owner of a shiatsu massaging unit. Have you ever tried one? The unit has a sturdy office-type seat back and a padded seat that fits neatly onto an office chair. A hand controlled unit operates the unit, which I have to say is ingenious. A rolling series of mechanised balls within the back of the seat unit pummels your back from the base of your spine to the top of your shoulders, or, any portion of your back you wish. The mechanized unit does not touch your spine in anyway but cleverly works your back each side of your spine with added heat if you select it. If you have a large curries or Comet store nearby they usually have them on display -you have to try them, they're absolutely great ! Today's news headlines make for a thoroughly depressing read. Scores of people have been killed in Baghdad following a series of car bombings where at least 127 people killed and 448 wounded, some critically. Climate change continues to provide the gloomy forecast of impending disaster and ongoing revelations at Haringey show how "baby Peter" continued to suffer horrific abuse when all manner of agencies should have stepped in. Drs at a clinic failed to spot that 17-month-old Peter was in horrific pain with a broken back just two days before he was killed. Yet peppered amongst the doom and gloom are stories of domestic chaos at Tiger Woods home, the Queen meeting with "Lady Gaga" and a bizarre tale of discrimination by a far right wing Christian hotelier abusing a Muslim woman over her dress. In truth I find that the banal is almost as depressing as the dreadful banner headline lead stories. Both make me wince. I do not consider myself to have an addictive personality. I don't drink and I don't smoke, I don't use drugs and I do consider myself to be a right thinking, relatively levelheaded chap. However, I do find myself checking the news headlines two or three times a day and feeling far more fed up after reading current affairs. The manner in which news is delivered troubles me. Katie Price aka Jordan, reality TV "stars" and bizarre stories, usually with a sexual connotation jostle for position with the life changing banner headlines. Sue has a tendency to watch morning television as she prepares for work. The magazine style program; GMTV is delivered in bite sized almost machine-gun delivered salvos. 25 seconds of a story devoted to the family of a soldier killed in Afghanistan leads into a two minute story about an overweight celebrity pet followed by a bizarre quiz asking the capital of France and the chance to win £10,000 by text at two pounds a time when the answers are (A) Bolton, (B) New York, or (C) Paris. The Segway from the tragic to the trite is about as jarring as a fat woman at a disco in her 50's on the pull. What is happening to our news content, and why do the providers think we need the peurile, pithy delivery? Why is there such an appetite for the banal? Who honestly is bothered about Kerry Katona's weight, or Britney Spears boozing? Is it me, or does the Emperor really have no clothes? Loads of music on the show today, mostly inspired by my ambulance driving mate up north; Gaynor! ...hey I've been podcasting for 5 years on 30th December 2009, can you believe it?! I don't tend to talk very much about my faith on my blog, that is certainly not something that I omit from choice, my head is usually so full of stuff, the thing that is foremost in my mind usually tends to spill out. Talking to a work colleague who is also a Christian earlier today brought into sharp focus the fact that life, as precious as it is, is really so transitory. We really are here for just a moment in the scheme of things, and if were lucky we may leave a mark or memory that is of some positive benefit. I expect that most of us we will have our "three score years and ten" plus or minus some years and probably vanish into the ether leaving a memory only with our friends and family that will fade like the momentary mark made by breath on a mirror. I certainly do not wish to sound maudlin, but if you simply believe we're here by chance, stay for such a short while and then simply decay, what would the purpose of all that be? That’s not only a let –down, it’s just seems so pointless. I can already hear the opposition view now "…There is nothing else, you make the very best of what you have and that's it, religion is simply a crutch to rest a hope upon". I’m happy and established enough in my faith to knock that old chestnut back. I feel that I have hope that is actually worth living. Without it, I would look towards the end of the game that I’m now over haklf way through and just see hopelessness. To live the life of a ‘real’ Christian, not just some nominal title given because of birthright or baptism, is to know real hope and to look forward, rather than put the inevitable to the back of one's mind. I am so very mindful of the fact that I am one of 6 billion and not likely to make too much of an impression to the world at large. I am, however, becoming ever more conscious of the fact that I can make a difference to the few people around me who I interact with. Even if you're not a believer, the Christian code and ethnic is one we should all try to live to. Resentment, anger, bitterness are good to no one. Charity, love and hope are so much more fulfilling qualities. If we are here for such a short period of time in the scheme of things, why not try to make your stay a happy one? ... and if you really think that life is not worth living, or wonder what the point of everything is, why not try an Alpha course at your local church? Walking into a church with your brains, retaining them and asking some sensible questions to make up your own mind is far better than some impassioned radical shouting Bible Scriptures at you. If it's not for you, fair enough, at least you've tried. If you’ve not tried it, you’ve no real basis to reason why it’s not for you. I am continuing to use my software speech recognition program; DragonDictate and I am absolutely delighted with it. The software is remarkably accurate, so accurate in fact that it picks up on the nuances of your speech and works at the grammar of what you're trying to say. I find it incredible that I can simply speak and create this entire blog post without using my fingers. I do tend to cheat and insert type when I've forgotten to insert a word or two, with use however I am finding that that is becoming less. I know of one of the person who has purchased the DragonDictate software since my blog post was created and he is as blown away with the applications as me. I would be interested to hear from anyone who has gone to investigate the purchase of the software, or, even made a purchase since reading my blog. PS this entire post was created with the software! I purchased the DragonDictate speech recognition software at the weekend. The programme was quite pricey at £90, but I had seen it in action and was very impressed with it. I had the opportunity to sit with a district judge who was using the program in between court sittings. The judge was producing his own orders using the speech recognition programme, the accuracy was incredible and the results instantaneous. Usually a solicitor will wait for anything up to 6 weeks a time for an order. The district judge was handing them out within minutes of pronouncing judgement. I could see the real benefit of the application and decide to purchase it at the first opportunity. The packaging tells me that the software is 99% accurate - I think it is probably more accurate than that and I'm astonished at how good it is. I am making this post with the application and so far the accuracy is running at 100%. What is a bit of a bind is the fact that the software will only run on one computer at a time, I suppose that's fair enough, but I would like to run the package on a number of computers that I own. You can purchase a license, I imagine that that would be quite pricey though. Installation would have been very simple, in fact, it was, but my little Advent net book did not want to play ball. The net book had been shipped with a faulty audio driver (Realtek), I replaced the audio driver and everything thereafter seemed to work as sweet as a nut. I would urge anybody interested in the speech recognition application for Windows to purchase DragonDictate Naturally Speaking 10. If you do a fair amount of typing, I imagine that this programme will save a massive amount of time and be an invaluable resource. I am surprised that the application does not appear to have reached a wider audience, maybe the pricetag still makes the average punter blanche? To be fair, I would not have purchased the application if I had not seen it in operation. I would be interested to hear and anybody else who uses a speech recognition programme to canvass their views. Please feel free to use the comments box below. I talk about the BNP onQuestion Time, great adverts, the X Factor and give a few shout outs to. All music from the podsafe music network, save for SSA and Tara Chinn. Download Podcast no 191 here (MP3) file, or find me on Itunes. I'm singing tenor by the way! This was a dress rehearsal for a mate's wedding back in 2001 - I'm thje small one in blue,and I'm 6'2". John (the good looking young bloke) wanted to surprise his wife with a barbers shop quartet - so here you're looking at me, John and his two brothers; Adam and John. ....is ....interesting at the moment. I've conciously not blogged anything following someone telling me to watch what I'm saying as people are reading this. Well, of course they are! This is what this is designed for, and quite honestly, life is too short to care what people think. It's been a funny old time with Mike flying the nest and going off to Theological College. People who aren't 'churched' have very different reactions to knowing what Mike is doing -they're nearly all positive though, and Sue and I are very proud of him. With Mike gone, the dynamic of the house changes - very odd, but again, all largely positive - life goes on. I'm concious of my not doing a podcast - one is imminent, I promise! ....and I would like to say more than I do, but, I am concious at present of who reads this. I will have loads more to say, that's a promise. It's finally here! Podcast 190. 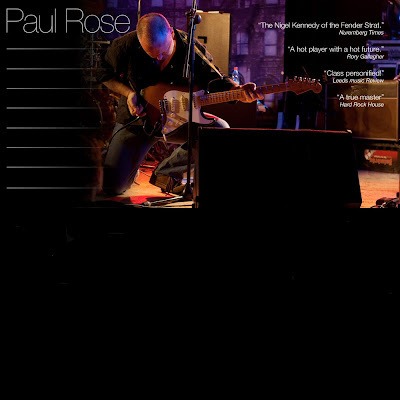 Musical Maestro; Paul Rose ( check out his link here ) joins me to talk about his fantastic new album; Note to Self. Definitely not a show to be missed. This is a photo from inside No.5 Chambers, Steelhouse Lane, Birmingham. It's a beautiful building that houses a number of specialist Barristers. The Courtyard is as pretty as it looks and is crammed with the midlands legal community at the no.5 Christmas party. Just a quick post before I start the working day. I'm travelling into Birmingham for a morning conference at a local chambers, off to a client's house in East Birmingham and then into the office. Birmingham has some pretty poor press, yet it's a great place to live and has a superb reputation for leisure - there are loads of great restaurants, bars, theatres, clubs, music venues and the like. I'm still a big fan of Birmingham and love the place. I miss working in the centre, but it's good to travel in only once in a while as you don't take the place for granted. I'll see if I can grab some quick photos into Birmingham and post them this evening. I am so sorry I've not updated the blog recently, I've been using it more as a storage space for the podcast which is daft, I know. I've fallen in and out of love with social media and in more recent times diverted my energies there. I'll try not to do that, but will keep the journal here a bit more up to date. I'm away next week in Cornwall and really hope that the weather holds up. Everyone at work seems to be jetting off to Cuba, Mainland Spain and all parts of the globe. I'm quite content to explore the UK in my caravan, as old as that makes me sound.... I caught Martin Clunes present on islands in the UK on terrestrial TV a few days ago and would love to follow suit - we're ever so lucky here in the UK to have such beautiful parts to travel to within no more than a few hours. OK, as I say, sorry to have a space that's appeared no more than a vacuum - I really must make sure that I do update more regularly. It does make me wonder if blogs have generally suffered at the hands of social media? Apparently Liverpool Cathedral's bells will peal John Lennon's 'Imagine' this week. The BBC article found at this link mentions that spokesmen from the Cathedral do not necessarily agree with the sentiments of the tune, which Lennon says was meant to be an 'anti-religion' anthem. As lovely as the tune is, I've always smiled to myself when listening to the lyrics. 'Imagine no possessions....' opines Lennon... worth a reputed $150,000,000.00 pre 1980. Whoops! I forgot to post the recording of the live stream... Music and chat from Dean Whitbread, Kosso and Phil Coyne. A veritable feast of chat and music... all wrapped up in a lovely MP3 for your aural delight..
Live chat and music from Paul - and guests Jason Boyle, Aaron Cooper and Lance Anderson. Hi - please feel free to join me on Friday 27th March 2009 at this link here. You can interact on the chat room, I'd love to see you for around an hour or so. Live chat and great music. Space - the final frontier? In space, apparently no one can hear you scream. I find that when I have space, I don't want to. I'm doing a very unusual thing right now as I type: taking a break at lunch time. Doing something apart from work. As much as I enjoy my work, I find it becomes less enjoyable - and productive if I don't break the day up with a lunch break. When I have a break, I stay much more focused. I naturally seem to gather clutter. I hoard files around me. Don't get me wrong, I know where everything is. At home, I'm surrounded by my Macbook, phone, Blackberry, iPod Touch, Camera, and virtually every conceivable wire and cable known to man - I've also a collection, usually of two or three cups and glasses. Why do I do that? The whole concept of space - staying away from clutter is something I'm trying to action. My life is also full of clutter. This time last year I was studying part time in the evenings, trustee of a church leadership, Chair of Governors, trying to write a novel, musician, dad of four, husband.... the list just goes on and on. Clutter. Over the last month or so, I've been waking at around 2 or 3 am with my mind buzzing about....everything, with the resultant effect that I can't get back to sleep for hours, drop off around 4.30am and then wake absolutely frazzled in time to drive 30 miles into work - usually around rush hour. So the cull begins. It strikes me that whatever I do, my family comes first. I spend far too much time (ironically) on the internet - and every other space of time is crammed with...stuff. I spoke to Sue about clearing ...physical stuff from our home. Again, we seem to hold on to...stuff... and when you analyze why you keep hold of lots of things, there's no other reason than not just throwing it away. At the weekend I'm ordering a skip. I'm going to take great delight in culling 'stuff' t get some empty space. I'm sadly giving up some of my extra curricular activities too. It's a case of having to. Podcast 185 - the recordig of the live show is right here. Jonathan Ross / Jay Leno eat your heart out...! Stacks of chat, music and interactivity in a bumper edition of the show recorded late Saturday / early Sunday 21/22 March 2009. Live chat from Phil Campbell back from SXSW, Dean Whitbread who talks about Rise and Shine and a mate of his who is a bit famous, and Steve Lacey in Seattle who now works for Google but can't tell us why! Have new content from my site sent to you by email.